Walther Arms’ latest is a gun you’ll want to check out. The PPQ SC (sub compact) is a scaled-down 9mm version of the brand’s popular PPQ model, and it packs an impressive list of features for both the range and Everyday Carry (EDC). Yeah, it’s not a new concept. And there are only two choices, so at first this isn’t very exciting. But, vive la difference, the PPQ SC has compact backstrap-to-trigger face construction—making it a great fit for most hands, even though it is on the thick side. This one’s worth writing home about. A majority of pistol-packers have to adjust their grip to reach the mag release on any handgun. The SC makes that majority a minority. That button is just—right there. Intelligent molding makes it both easy to get to, and hard to unintentionally release. Walther got this right, in a big way. Kudos to any company that can step away from tradition—in this case their already perfectly nice paddle-style release—to try something new. 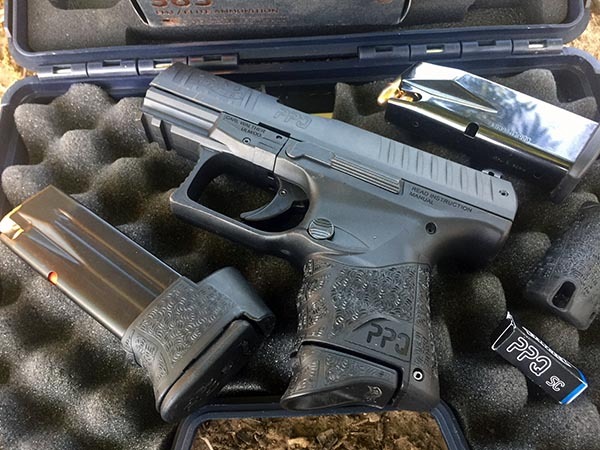 This design is included in other PPQ models, but the SC makes it the first in a concealment-friendly package. Yes, that’s plural, “levers.” One for the right-handed shooter and one for the lefty. This isn’t entirely a new feature for the company’s PPQ line, but it’s praiseworthy. Sending the slide “home” is effortless and faster using just the firing hand thumb, leaving the support hand free to support or do other things in a critical situation. 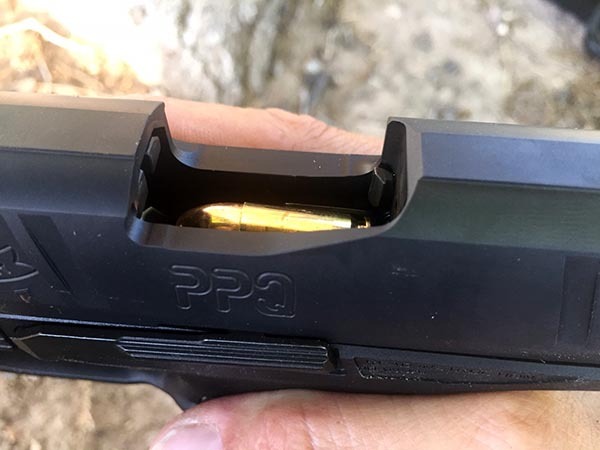 In numerous reloads from slide-lock, the PPQ SC slide never failed to put a round fully into battery. This trait shaves critical fractions of a second, more for some shooters, off reloading or malfunction-clearing, making victory in competition or a real-life encounter more likely. No more saving up hard-earned greenbacks for an extra mag. You get choices right out of the box. 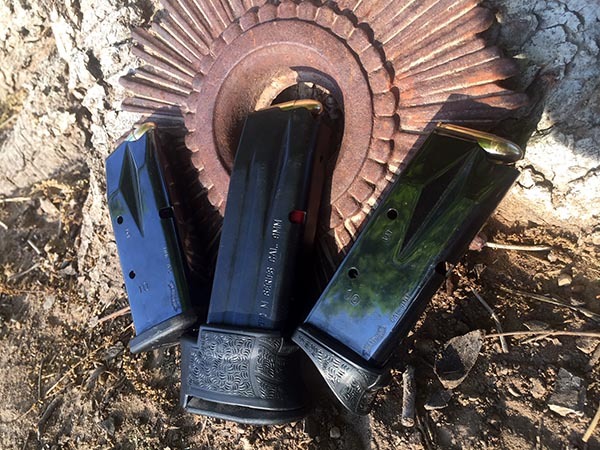 Two 10-round mags are included, one flat-bottomed and one with a pinky-support floorplate. The third is an extended model with 15-round capacity. A sliding collar around the mag, akin to those included with the M&P Shield series’ extended mags, takes up the extra space below the grip. Having a 15-round mag transforms this concealment gun into a serious range firearm in an instant. Its inclusion with purchase represents real value. 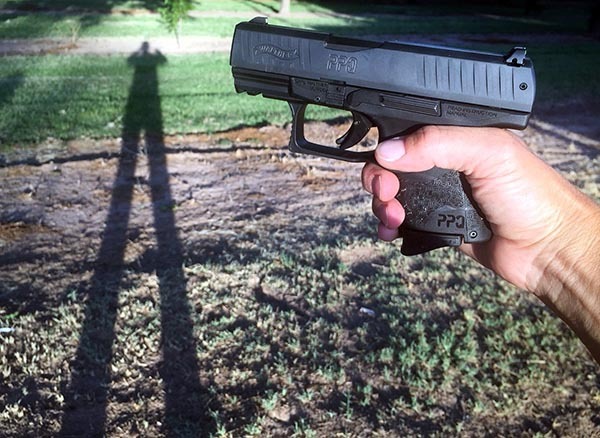 The PPQ SC’s polymer, adjustable-rear, three-dot sight system has luminous dots. The more they’ve been exposed to light, the brighter they are. It’s not the most deluxe set on the market, but it’s a substantial upgrade from the standard sights of most brands. And if that’s still not good enough for you, there’s a factory upgrade available. Walther got smart here again, saving weight and adding functionality by stretching the ejection port over the top, even opening up the 11-o’clock side. It’s another nod of respect to left-handed shooters, who’ll find unloading much more forgiving with this firearm. It also makes it easier for anyone to clear malfunctions. I’ve never been so glad to see less material on a handgun. Modern striker-fired pistol consumers should expect simple and easy field stripping. But Walther made the process one that doesn’t require fine motor work aside from pinching two buttons between the pads of the thumb and forefinger. Again, they took a good concept and made it better. This makes the gun one that can easily be maintained by users with hand disabilities, when compared to others on the market. Okay, so maybe this isn’t an ergonomic trait, but isn’t getting to shoot more and clear malfunctions less a user-friendly trait? Yeah, I thought so too. I stacked all sorts of mixes of brands and bullet weights in the three mags, and all fed reliably. Not one failure to fire, for any reason, in approximately 200 rounds so far. 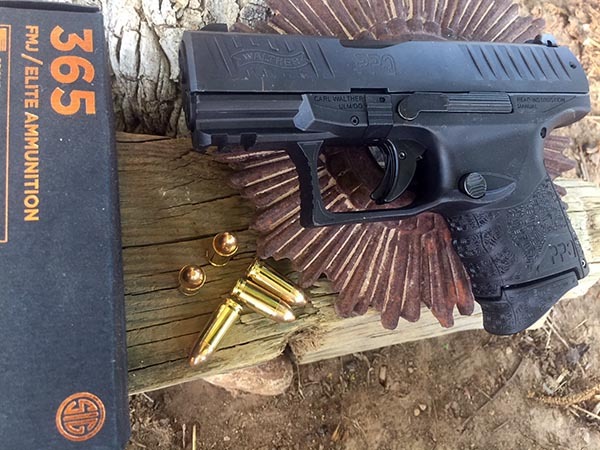 There are other cool but not quite celebration-worthy features on the PPQ SC. A Picatinny rail makes it accessory-ready. Cocking serrations both in front of and behind the ejection port will appeal to RMR users and those who like using forward serrations for press checks and such. Grip texturing is slight, but bordering on artistic. No boring checkering here; more like an elaborate wallpaper design. I like it, but those who prefer an aggressively textured grip might be reaching for the soldering iron. Yes, it’s the type Walther is known for, with a 5.6-pound pull, a mere 0.4 inches of travel, and a superb break and short reset. It’s great, and what those familiar with the brand have come to expect. Safety features are built-in; only one is visible—a standard trigger block lever. There are two internal drop safeties, according to the company—I didn’t go deconstructing the sample gun to find out. Walther went straight for pro appeal by not including a thumb-operated safety option. On the instructor/shooter side of my life, I’ve seen and experienced more trouble than help from thumb safeties on striker-fired pistols, and am pleased to see it not included. A good holster and finger discipline are superior to mechanical safety devices anyway. But when does the fairy tale end? This is really picky, but this writer isn’t crazy about the rounded edges magazine floorplates, especially the pinky-supporting one. When floorplate shape echoes cartridge shape, only tactile confirmation is needed of that magazine’s position in a pouch or pocket. The only gripe I have with the PPQ SC is its chunkiness. At 1.3 inches wide, it’s substantially thicker than most concealment guns and will require some planning to conceal effectively as compared to similar handguns. Of course, its substantial round capacity and range-friendly handling offset this. Specs not already mentioned include a barrel length of 3.5 inches, and height of 4.4 inches, not including a magazine, The weight is a modest 21.2 ounces, unloaded. With current prices in the mid-$600 range and all the aforementioned amenities included, the Walther Arms PPQ SC is a worthy investment. Don’t forget the changes made to the interior of the slide. They reduced reciprocating mass by replacing steal with plastic in some places. That quick cyclic rate and reduced mass makes for a smooth shooter! Good write-up! Thanks for that extra info on the brand and PPQ SC! The PPQ is probably the BEST striker fired pistol in the world. I have to agree, Canik triggers are superb. Earlier models had a trigger assembly component that was weak–my TP9 SA’s failed at around 3,500 rounds. The factory replaced it with the updated version and it’s been great.